I've been called dramatic a time or two, so I thought it was only appropriate to do a blog on a little drama. Recently I saw these tables and thought they are just perfect and full of DRAMA. This table is not to over done, but there is a little drama and flair. 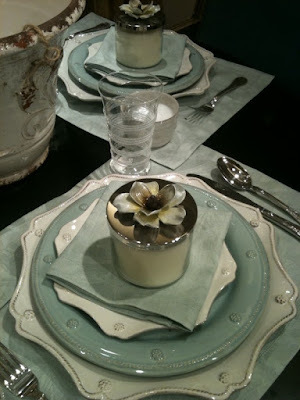 The white dinner plate is by Juliska and is part of their "Berry & Thread" collection (available in several colors), you can find Juliska online at wwww.Juliska.com and also at Neiman Marcus (both in the store and online) and in Brenham you can find Juliska at Beadboard Upcountry. 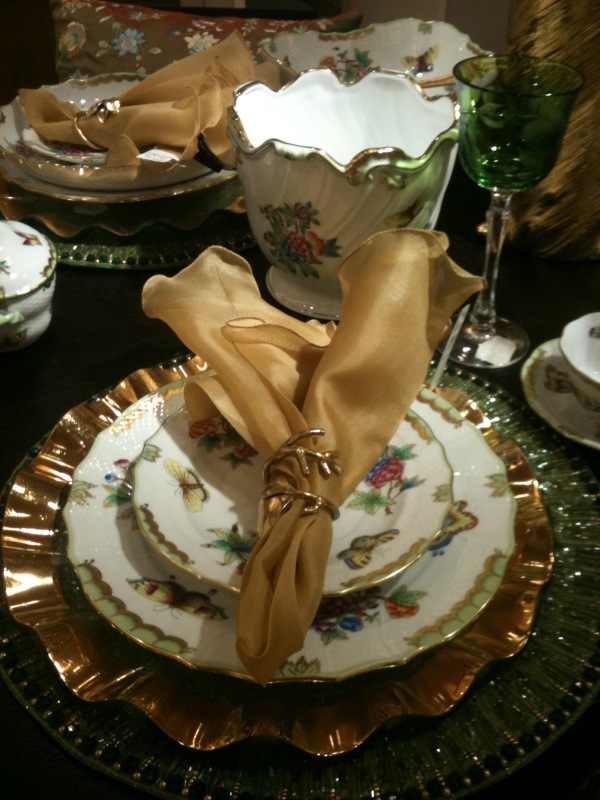 The "Berry & Thread" dinner plates will cost approximately $156.00 for 4 plates. 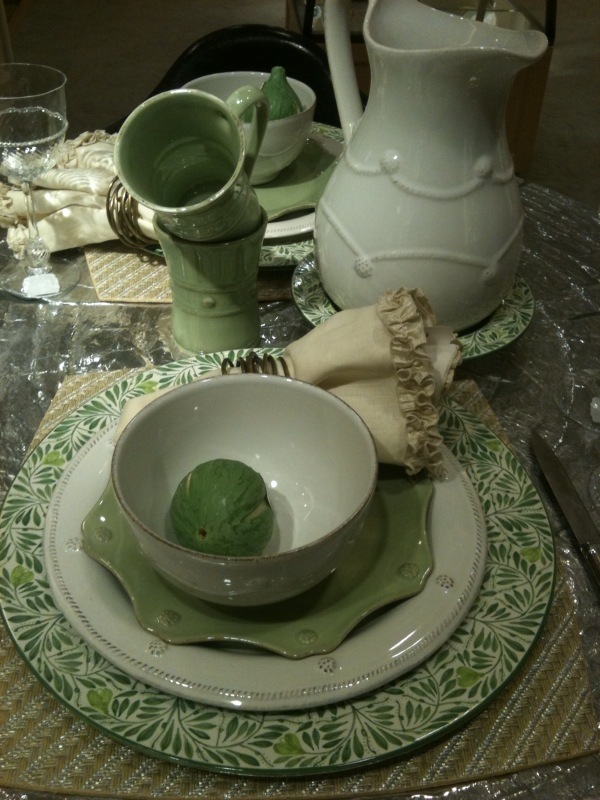 The salad plate is also apart of the same collection only shown in pistachio and scalloped. The cereal bowl is also included in the collection. The pitcher is shown in the largest size and will cost you about $94.00 Don't forget the mugs, but my FAVORITE, FAVORITE Juliska pieces are their glassware and unfortunately I did not take a great picture because you can barely see the prettiest wine glass (for causal use) I have ever, ever, ever seen. Juliska's Graham drinkware is oh so pretty, with a clean look with just enough detail to not be boring. I love it. The wine glass holds 8 ounces a set of four will unfortunately cost you $296.00 but you can buy them individually. The Graham drinkware collection has any piece you could possibly need to serve a beverage from. I love dishes, and parties and entertaining. So it's only natural that I would love to own Herend porcelain dinnerware. I can imagine that in one of Martha's houses she definitely has Herend. The picture is of one of Herend's best selling collections "Queen Victoria." Herend began 180 years ago producing porcelain for rulers, historical personages, leading businessmen and artist. So for "Queen Victoria" or "Rothschild"(which has been produced for 150 years) to be best sellers is not surprising. I would definitely pick "Queen Victoria" (and one other pattern) if given the opportunity to "go wild" at Herend. This particular pattern is a white porcelain with hand painted floral and butterfly design with a 24 karat yellow gold trim. When you have this kind of handcrafted detail and years of invested craftsmanship, there will regrettably be a heavy price tag attached to own and cherish a picturesque table setting. The dinner plate alone is $175.00, the salad plate $135.00, the bread and butter $125.00, tea cup (which holds 8 ounces) $120.00 and the saucer is $60.00. To sum it up, it will cost $615.00 for one place setting of Herend's Queen Victoria's dinnerware or $7,380.00 in case you would like to have a dinner party for 12. That is definitely dramatic for anyone! The napkins are gold organza and the napkin rings look like Michael Aram but I am not certain. Blue is not usually one of my favorite colors (turquoise yes, blue not so much) but, this table was fresh, pristine and crisp. I was really drawn to it. Most likely because it is assembled with Juliska dinnerware and glassware with a linen napkin and a candle to top it all off. The Juliska dinnerware is all from the "Berry and Thread" collection in different color choices. The glassware is from Juliska's "Ella" collection, it's the large tumbler, it holds 16 ounces and cost about $54.00. To top off the simple but slightly dramatic table setting each place setting was given a Michael Aram "Magnolia" candle. This over the top candle is not only decorative and fragrant, but will burn for 60 hours with it's triple wicks in soy wax. The extraordinary feature you will not see on other candles is the nickle plate lid with the embellished enameled magnolia flower on top. It's gorgeous and smells like the flower it represents. Top off your guest with this candle and you are screaming DRAMATIC. The Michael Aram candles are available in four other scents and embellishments at $60.00. Michael Aram has many wonderful things for your home and tabletop. A couple of looks for a dramatic evening of entertaining.